Grandma's Scottish dessert recipes will remind you of the Scottish Highlands. Just wait till you taste the authentic scones, black buns, fruitcake, and shortbread made from these traditional Old Country recipes. My Grannie Bell made delicious scones, and she served them warm from the oven, buttered, and smothered in thick, homemade orange marmalade. Such a simple dessert, yet they were so good. I can still taste them after all these years! Check out the great Scottish dessert recipes I've chosen for you. 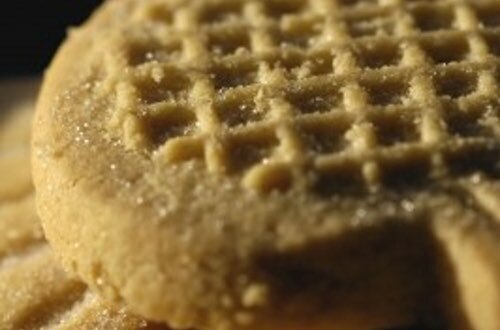 Enjoy trying the actual treats that my Grannie loved to make. The Scotsman had a name for it of course. 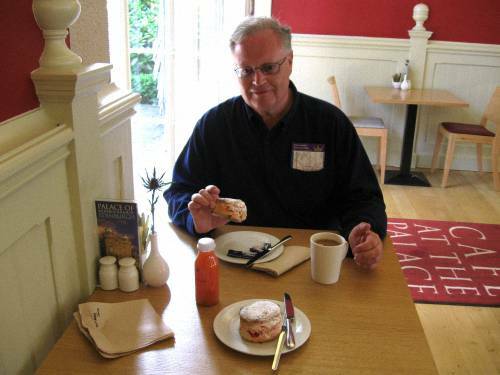 He wanted his "scone" — to start the day right. 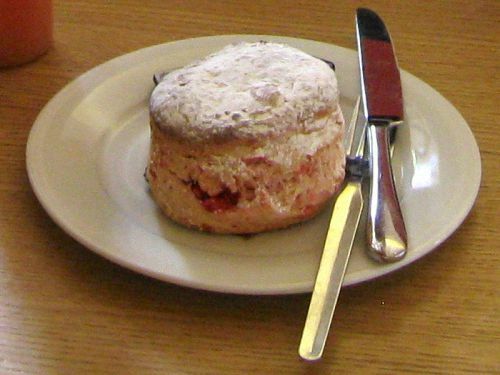 The scone is as native to Scotland as white heather. The old fashioned scone recipe makes a scone (pronounce as in "gone") that could have come right out of a bake shop on Sauchiehall Street in Glasgow. Try it for breakfast, or lunch, or supper, and "sure, you'll be wantin' yer scone ev'r maunin'." Ingredients: 2 cups sifted all-purpose flour, 1/2 teaspoon cream of tartar, 3 tablespoons sugar, 1/2 teaspoon salt, 3 teaspoons baking powder, 2 tablespoons poppy seeds, 6 tablespoons butter or margarine, 1/2 cup seedless raisins, 1/2 cup milk. Sift together flour, cream of tartar, sugar, salt, and baking powder. Blend in poppy seeds. Cut in butter or margarine with 2 knives or pastry blender until it is the size of small peas. Add raisins and blend well. Add milk gradually, blending until dough is fairly soft. Turn out on lightly floured board and pat into round cake about 9 inches in diameter. Place on greased cookie sheet and with back of knife, cut across in quarters, not cutting completely through the dough. 1 quart flour, 1 teaspoon baking soda, 2 teaspoons cream of tartar, a little lard or butter, salt and sugar to taste. Mix ingredients. Warm the flour. Add butter, milk or water to make consistent dough. Turn out on board and handle as little as possible. Turn out round, and bake in a skillet, or on top of stove. When one side is done, turn over. Note: whole wheat flour can be used in the same way with this Scottish dessert recipe. 1/2 pound flour, 1 pound raisins, 1 pound currents, 1/4 pound sugar, 2 ounces blanched almonds, 2 ounces candied peel, 1 teaspoon ginger, 1 teaspoon cinnamon or spices, 1/4 teaspoon Jamaica pepper, 1/2 teaspoon caraway seeds, 1/2 teaspoon soda, 1/2 teaspoon cream of tartar, 1 teacup sweet milk or old ale may be used instead. With the hand mix well in a basin all above ingredients. Line a cake tin with a plain short crust rolled out very thin, and put the mixture in this prepared tin, and roll out the scraps of paste to cover top. Wet well the edges. Place top cover on and press well around the edges. Prick top with a fork, and brush over with sweet milk. Bake in a moderate oven for at least 3 hours. Serve with butter or jam. Line an 8" pie pan with baking parchment. Preheat the oven to 325° F. Thoroughly cream the butter and sugar together. Slowly beat in the eggs, adding a little flour to prevent curdling. Stir in orange rind to taste. Sift the flour, baking powder, and salt together. Fold the flour mixture into the creamed mixture and add the almonds, fruits, and candied peels. Spoon batter into the pie tin, smoothing the surface while indenting the center slightly so it won't rise higher than the sides. Place blanched almonds on top to decorate and brush the top with beaten egg white. Bake for about 3 hours or until cake tester or toothpick comes out clean. Warm the water in saucepan, melt in the butter, add the sugar, and bring to a boil while stirring. Stir in the milk and simmer for about 20 minutes while constantly stirring to avoid burning. Remove from heat, add flavoring of choice, and beat hard for 5 minutes. Pour tablet into greased tin and when partly cooled, cut into 5 x 1-inch bars. Wrap cold bars in waxed paper and store in airtight container. In the USA use Super Fine sugar, sometimes called Bar Sugar. In Canada use Super Fine or Berry Sugar. These sugars are finely ground versions of granulated sugar, yet they are not powdered like icing sugars. Spread oatmeal on a baking sheet and grill in oven for about 2 minutes (or slowly toast on cast iron pan) until it smells warm and pleasantly nutty. Crush 1 cup raspberries with a fork. Whip the cream until thick, then stir in honey and whisky. Add the crushed raspberries, stirring gently, then the remaining whole raspberries. Finally, gently fold in the toasted oatmeal, spoon into serving glasses, and serve at once. This Scottish dessert recipe makes enough for 4 tasty servings. 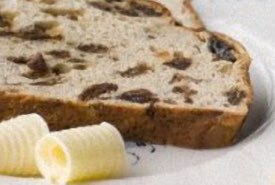 A cup butter, two of white sugar, four of sifted flour, three-fourths cup sour milk, half teaspoon soda, nine eggs beaten separately, one pound raisins, half pound currants, a fourth pound citron. Cream the butter and sugar, add milk gradually then beaten yolks of eggs, and lastly, while stirring in flour, the whites well whipped. 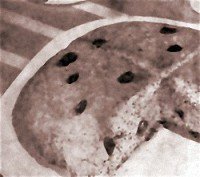 Flavor with one teaspoon lemon and one of vanilla extract, and have raisins chopped a little, or, better still, seeded, and citron sliced thin. Wash and dry currants before using, and flour all fruit slightly. Take 1 pound of butter, 2 pounds of flour, 8 ounces of powdered sugar. Mix the sugar in the butter, then take in all the flour and thoroughly mix and rub all together till of a nice mellow color and easy to work; weigh off the size required, and shape into square or round pieces; dock them on the top, notch them round the sides, put on clean dry tins, and bake in a moderate oven. Weigh the oranges and set aside an equal weight of sugar. Put the fruit, whole, into cold water to cover, bring to a boil, pour off the water and add as much more, and simmer until the fruit can be easily pierced with a fork. Cut the fruit in thin slices, throw away all of the seeds, return to the water, add the sugar, and cook until it jellies, about an your or less. Put into jars for use. One egg, 1/2 cup sugar, 2/3 tablespoon melted butter, 1 cup rolled oats, 1/3 teaspoon salt, 1/4 teaspoon vanilla. To make this Scottish dessert recipe, beat egg until light, add gradually sugar, and then stir in remaining ingredients. Drop mixture by teaspoonfuls on a thoroughly greased inverted dripping-pan one inch apart. Spread into circular shape with a case knife first dipped in cold water. Bake in a moderate oven until delicately browned. To give variety use two-thirds cup rolled oats and fill cup with shredded coconut. A while ago, I attended a Solo Build It (SBI!) 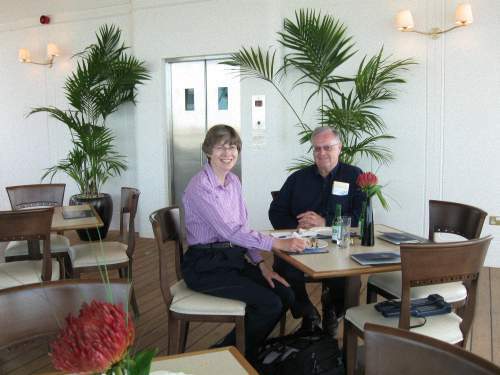 Webmasters Conference in Edinburgh, Scotland with my wife Vicki. We met other website owners from the UK and beyond, and I received many helpful ideas on how to improve this old fashioned recipe site. However, please allow me tell you about the wonderful Scottish food. 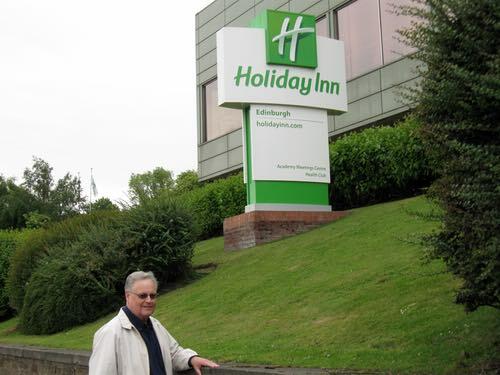 Our noon meals at the Holiday Inn® Edinburgh featured an all-you-can-eat buffet that was simply to die for. I determined to not overeat yet found myself sneaking back for seconds. The beef entree was too delicious to resist! And after all, this was partly a working holiday. 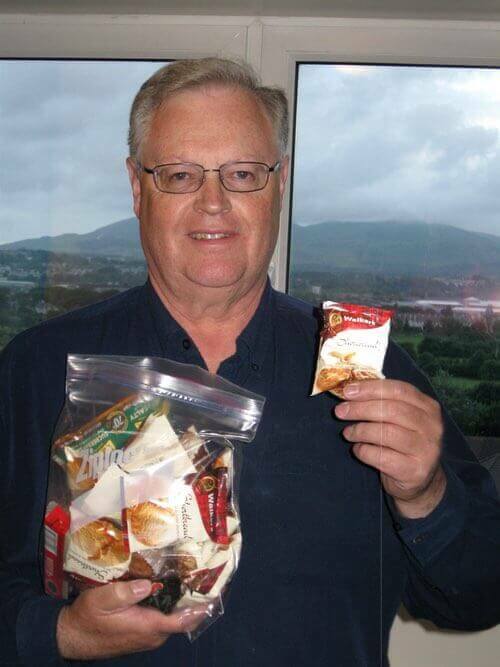 At coffee breaks, there were endless packages of Walkers® Pure Butter Shortbread cookies, and their ginger biscuits were equally delicious. Scottish shortbread treats are impossible to resist! To make your own shortbread, see the Scottish dessert recipe for making traditional shortbread on this page and the other easy-to-make recipes for shortbread elsewhere on this site. One evening, we attended a Scottish "Ceilidh" (pronounced KAY-lee) at the popular Ghillie Dhu where we enjoyed dining on a traditional haggis with bashed neeps and tatties, chicken breast stuffed with black pudding, followed by a traditional "cranachan" or cream crowdie which was served with a rich buttery shortbread biscuit. The Scottish dessert recipes on this page also include a traditional-style recipe for Cranachan, so be sure to try it. Later on, after a side trip to North Yorkshire, England, we returned to Edinburgh where we spent several nights at The Hedges, a 4-star B&B accommodation beside historic Calton Hill, within walking distance from the Royal Mile. Our friendly hosts Heather MacDonald and her husband Ian spoiled us with their splendid accommodation and breakfasts. When you visit Edinburgh, and I hope you do soon, make plans to stay at The Hedges Guesthouse. You'll love it! Guaranteed! Please tell Heather and Ian that I sent you. She'll make you feel right at home. That's Heather with me in the photo above. Heather's breakfast choices included homemade oatmeal porridge served with a choice of heavy cream, honey, or whisky. That's right, Scotch whisky! That was followed by your choice of a fresh fruit platter, poached kippers, or smoked Scottish salmon, Or, you can order a full Scottish breakfast consisting of haggis, Ayrshire bacon, sausages, and your choice of eggs. Are you hungry yet? Breakfasts at The Hedges are all home-cooked, absolutely delicious, and served in a comfortable dining room complete with an antique cabinet displaying dry cereals and Scottish jams for those wanting a lighter start to the day. Believe me, I didn't hold back — I went for the full Scottish! While in Edinburgh, do take time to visit the Royal Yacht Britannia. The 412-foot ship once served as a floating palace for the Queen on her overseas tours. 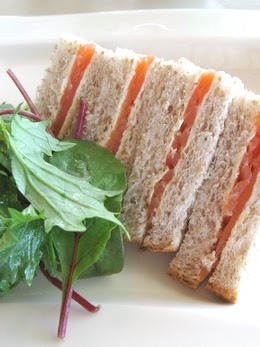 It's a fascinating place to spend a morning and while aboard her, you can enjoy a wonderful lunch in the Royal Deck Tea Room. 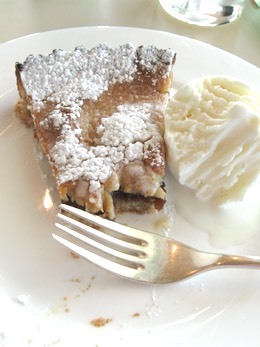 For instance, a satisfying sandwich of Shetland oak smoked salmon and cracked black pepper cream cheese on wholemeal bread, followed by a slice of homemade apple pie topped with Porelli vanilla ice cream hit the spot after a morning's site seeing. 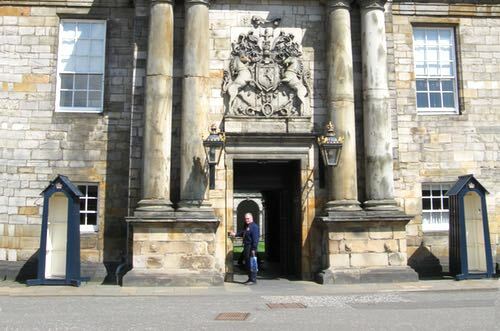 We also visited Holyrood Palace where I got to try some Scottish fruit scones smothered with dairy butter and blackberry jam, with a generous dollop of clotted cream on the side. The scones were large and bursting with fruit and so good tasting! Almost as good as Grannie's. Doesn't it look delicious and inviting? Ready to be split open and buttered. Her Majesty serves good scones! Now, you can enjoy a similar "wee taste of Old Scotland" thanks to the Scottish dessert recipes from Grandma's collection. After a day filled with walking and sightseeing, we always looked forward to our main evening meal, and Edinburgh offers a wonderland of dining experiences. For instance, we enjoyed a lovely pub dinner of wild venison pie with mushrooms at The Conan Doyle, and the following night we experienced fine dining with braised lamb shanks followed by — you guessed it — a homemade sticky toffee pudding smothered in custard sauce and genuine whipped cream. Delicious to be sure! 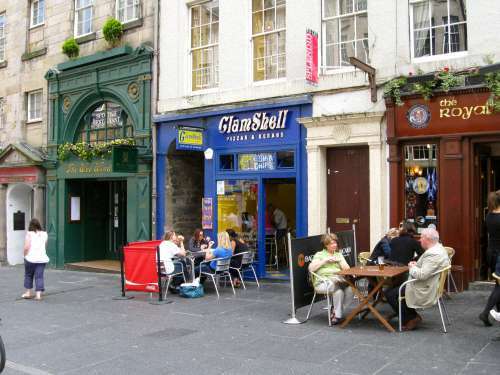 Finally, we couldn't simply leave Scotland without tasting a battered Deep Fried Mars Bar at the ClamShell, a popular fish & chip takeaway on the Royal Mile. Tons of calories, but so yummy! It was so filling that we skipped our evening meal and had only coffee before returning to The Hedges. 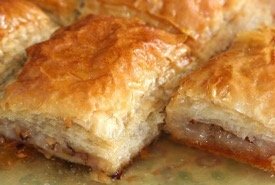 And before you criticize my lack of restraint, I've added a Scottish dessert recipe for making Deep Fried Mars Bars on this site to tempt you. Admit it; you're curious to try it. From the delicious clootie dumpling to family favorites like Scottish pancakes served with homemade raspberry jam, you'll love the authentic Scottish dessert recipes featured on my friend May's website. Scotland's Enchanting Kingdom is your online passport to the ancient Kingdom of Fife.